Home staging is all about enhancing a house to appeal to the most number of potential buyers. Just as you wouldn’t expect to get a good price for a car with no service history or scratched bodywork, so a house needs to look well cared for and attractive to sell for the price you’re hoping for. Here are some common tricks and tips for home staging that you can use when selling your property. Be open minded and remember, how we live in our homes and how we present them for sale are often very different things. You’ll want to create a welcoming first impression, so an hour or so before the viewing, throw open the windows to really freshen up the place, but don’t use chemical air fresheners, which could trigger asthma attacks. Remember to close the windows again during the winter and to light the fire, turn on the heating and switch on a few lamps to create a cosy atmosphere. Keep pets and all their paraphernalia outside or in the utility room during viewings, and sprinkle around drops of essential oil, such as lemon, bergamot or geranium, for a spot of aromatherapy. Leave your estate agent to conduct the viewings and let the house sell itself. 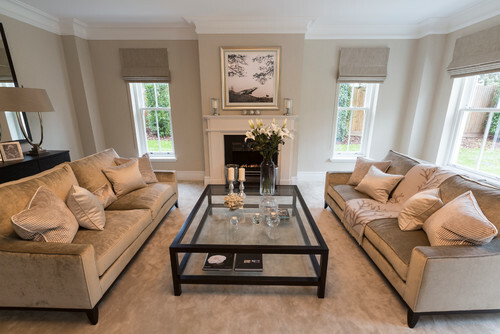 Have you ever viewed a show home on a new development and felt so at home you wanted to move in right away, or felt inspired to go home and make some changes in your own house? 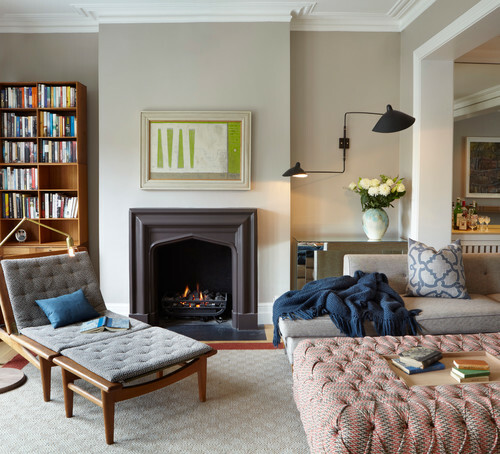 Property developers and interior designers work closely with estate agents to create the right look and feel for target buyers. 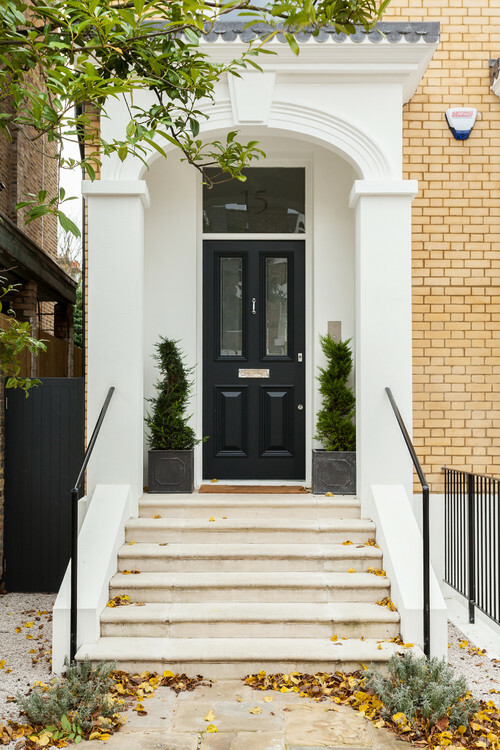 Don’t forget that your house could be competing with a new build down the road (which may have stamp duty and part exchange incentives), so your house needs to have some major selling points, too. And in the US, where home staging is a longer established industry, houses that have been staged typically sell in half the time and for 8-10% more than unstaged ones, according to the Real Estate Staging Association. Save It’s rarely worth the time and expense of buying a new kitchen when you’re selling your home. Your buyer is likely to have very different requirements and taste, and the kitchen will often be updated or replaced by the new owners anyway. Kitchens do sell houses, however, so make it look as good as possible without ripping it out and starting again. 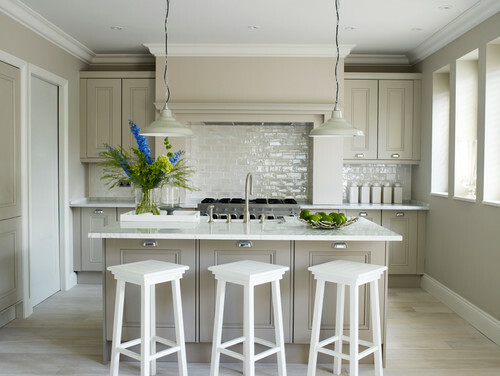 Spend Consider replacing worktops and splashbacks, or even just re-grouting your tiles. Add decorative touches, such as fresh flowers, fruit in a bowl and coordinating small appliances, and keep the worktops as clear as possible to maximise the sense of space. Adding decorative touches and removing purely functional items in this way implies plenty of space and storage – and who doesn’t want that? View thousands of beautifully styled kitchens. 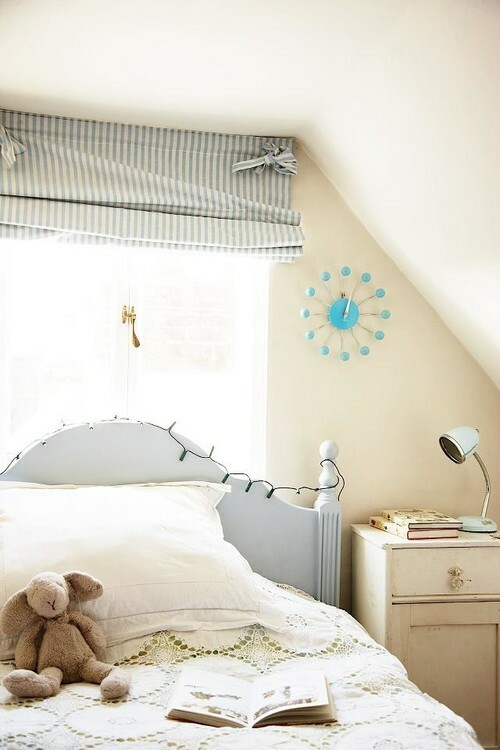 Spend If you’re currently using a bedroom as a study, walk-in wardrobe, playroom or box room, it’s really important to present it as a bedroom when you put your house on the market, since the number of bedrooms is such a valuable selling point. Consider buying an inexpensive bed and making it up – you can always sell it later on if it isn’t needed in your new home. Save Start packing what you won’t need for the next few months and store the boxes in your loft or garage. Decluttering like this will help sell your house, and save your time when it comes to the big move! 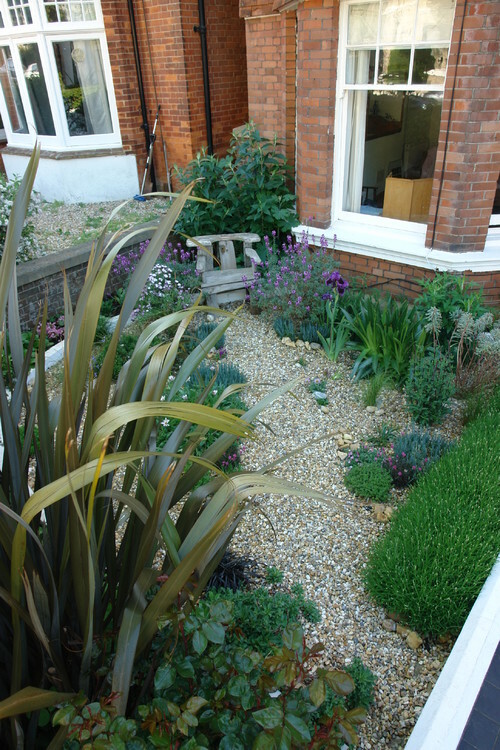 The front garden is a critical part of your home’s presentation. Take a good look at what your buyers may see as they arrive. You may not notice the cracks in the render or the plants growing out of the downpipe, but your buyers will, so get it addressed before you go on the market. Start a list of everything that could be done to update or improve your home, from weeds and cracked paving to dirty windows and slipped roof tiles. Buyers will either be put off, or make a low offer if they feel your home isn’t well cared for. Spend …but gravel is an inexpensive and popular landscaping option, so use it if your path needs an upgrade. Save A bit of elbow grease may be all that’s needed to improve that important first impression of your home. Is the front door cobweb free and gleaming? Does the doorbell work? Add a smart and inexpensive house sign with a clear name or number. It’s really off-putting for buyers to struggle to find your home. Spend Do invest in a pair of pots either side of your front door, containing a healthy evergreen shrub, or a hanging basket or two in spring and summer. Add some outdoor lights for winter viewings – some fairy lights in a tree or solar lights to line the path. 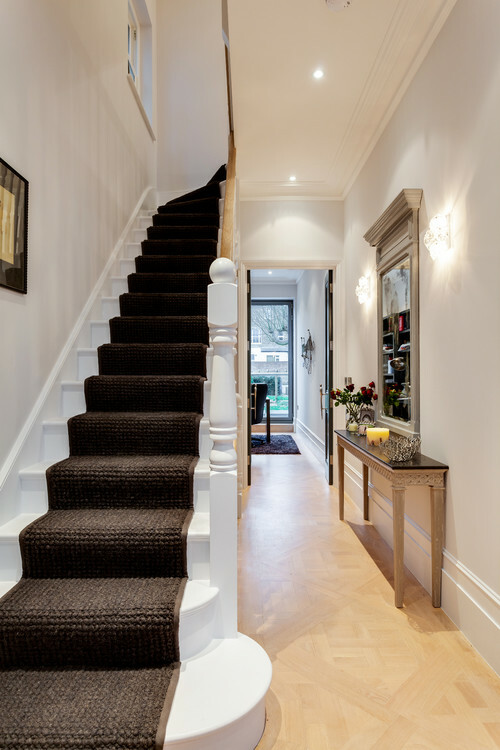 Your hallway sets the tone for your whole house, so it needs to be beautiful, inviting and, most importantly, uncluttered. Save Don’t make viewers squeeze past over-laden coat racks, piles of shoes and buggies. Stow everything away out of sight to show that your house has ample storage. Spend No need to splurge here at all. Simply dress a console table with a vase of flowers and ideally place a large mirror over it. Your buyers will soon start to imagine themselves living a serene, uncluttered life in your home and be excited to see how the rest of the house looks. Save Flooring is a very important consideration when you’re selling. If you have floorboards, or better yet parquet or block flooring, have it professionally sanded and sealed and throw a neutral rug down. The rug will move with you, of course, while a carpet won’t, so don’t necessarily splurge on that. Spend If, however, your carpets are dated, heavily patterned or worn, then replacing them with a pale, neutral design is a relatively inexpensive option. Potential buyers will estimate the cost of replacing carpets to be much higher than it is, and either make a low offer or none at all. But fresh, neutral carpets are sure to impress your buyers. Bedrooms are generally very easy to present well. 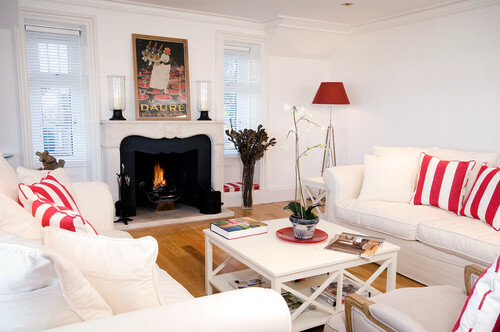 The look you are going for is boutique hotel: calm, coordinated and cosy. Put away all clothing and clutter and add small decorative touches, such as pretty lamps, vases or artworks. Save You shouldn’t need to invest in new bedroom furniture, provided you have a suitable-sized bed for the room, and matching bedside tables with lamps. Spend Do invest in good-quality white bedding (ideally long-staple cotton sateen for a hotel-quality finish). Go for the best you can afford – you will sleep all the better for it during the stress of moving (plus you’ll take it with you). 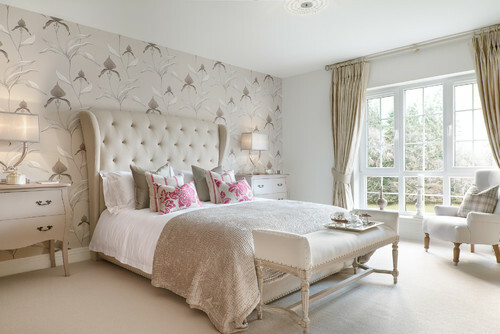 Accessorise with coordinating cushions and a throw or bedspread but keep the colour scheme soft, relaxing and muted. Finish with a tactile, soft rug if your budget permits. Learn how to choose the perfect duvet and pillows. The ideal colour scheme for your home when selling is a neutral palette, since a strong or challenging scheme could alienate some buyers. Even someone who prefers intense colour should be able to see potential in the space and how they can make their own mark on it. 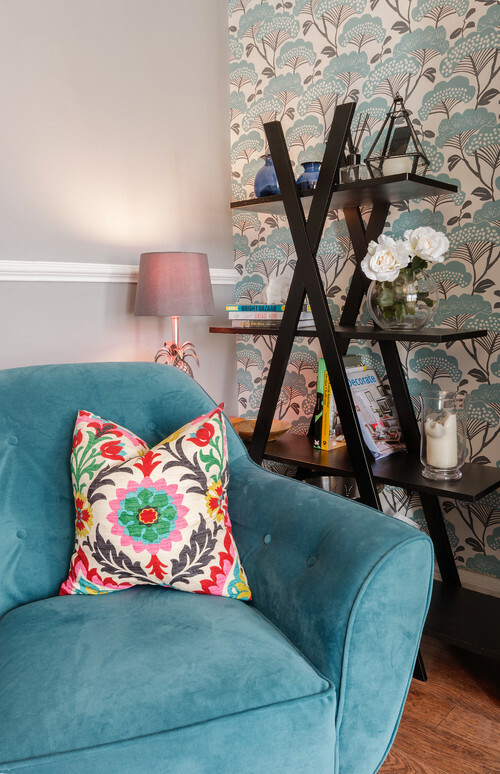 Strong colours can also make a room seem dark and small. Maximise the sense of space and light. Throw the curtains open wide and use tie-backs or finials to smarten the look. Remove or open net curtains and ensure your windows are spotlessly clean. Don’t play it too safe, though – add interest with subtle colour in your accessories, such as cushions, blinds and curtains. Spend Cushions and throws can be inexpensive yet high-impact ways to update your home. Or keep to a neutral palette and opt for high-contrast textures in your accessories instead, layering satin cushions with faux fur or a chunky knit. Save Taste is very personal, so it’s not a good idea to paper a whole room in expensive or dramatic paper. Well-prepared and painted walls will be just as impressive. However, a soft neutral metallic paper on a feature wall will add wow factor. Spend If you have the budget for new living room or dining room furniture and plan to upgrade later on, why not upgrade before you move? Replace your dated suite, with its sagging sofa cushions, with new furniture that will move with you. Save Alternatively, focus on the flow and layout. If your room is crowded, edit your furniture – it will only be for a couple of months. Either sell or store the extra items, but be ruthless. If you’re unlikely to need it in your new house, don’t waste money on moving or storing it. In a large room, ‘float’ your seating into the room, rather than pushing it against the walls. This creates a more sophisticated feel and you can add a console table behind the sofa, or add side tables for interest and display. Spend Try to keep these rooms neutral (rather than painted in football team colours) and add interest with decals, which are easy to apply and remove without damaging the walls. Save Ruthlessly declutter, storing toys, books and odds and ends out of sight (and make sure there are no stray toy cars for your potential buyers to slip on). Make up the bed with fresh, clean bedding and accessorise with cushions, a small rug or a throw. 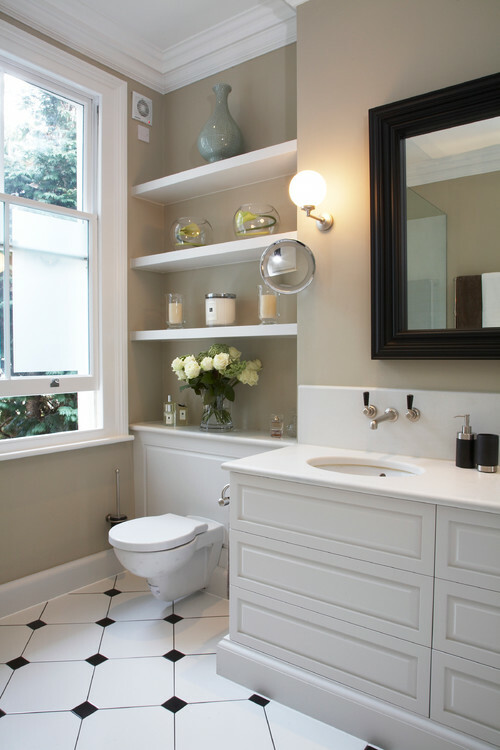 Bathrooms need to be completely decluttered and depersonalised. And always, always keep the toilet lid down for photographs, viewings and open days. Save Unless you have a non-ironic retro bathroom suite, in avocado or pink, there’s probably no need to replace it. Instead, focus on stowing away all cleaning products, bottles of shampoo, shower gel and soap. Remove medicines, tablets, tubes of toothpaste and anything remotely intimate or personal. Your buyers really don’t want to be reminded of who lives here. And, of course, make sure it’s scrupulously clean and tidy. Spend Do remove carpets or rugs as these are very much out of style in bathrooms and could appear unhygienic. Replace with vinyl or tiles. Add new white fluffy towels (keep them for show only, you can always use them after you’ve moved). Add a healthy green plant or vase of fresh or faux flowers. Re-grout tiles and remove any trace of mould or mildew. If you have a shower curtain, it’s worth replacing it with a screen instead as this is an inexpensive upgrade that will add more wow factor. Shower screens maximise the light and are more hygienic and easy to spruce up for viewings. Spend some time buffing your taps and making all surfaces clean, dry and smear-free before viewings.